Often when we are looking for something, we find something else that turns out to be of more use. And sometimes we don’t even realize we’re looking until we’ve made a discovery. 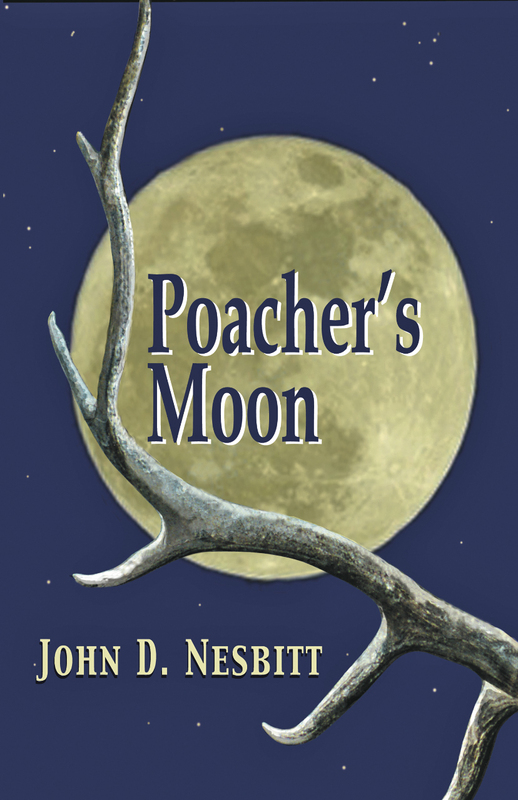 The protagonist in Wyoming author John D. Nesbitt’s Poacher’s Moon (Pronghorn Press, $19.95) is looking for a way to escape, even for a time, the numbing drudgery of an occupation that does nothing more than pay the bills. There is a thoughtful tension in Wilf Kasmire’s life that will ring true with working stiffs everywhere. He only truly feels whole and at peace when he’s in the out of doors, and his decision to try his hand at guiding other hunters as a way to meet the bills is a natural enough turn, but the real treat is when it leads to soul-probing conversations with his paramour, Adrienne, a feisty woman whose grounding presence in his life seems like just rewards after years of restless solitary angst. Theirs is an adult relationship built on genuine mutual fondness, quirks and all, calling to mind Robert B. Parker’s Spenser and Susan characters. Nesbitt, author of two-dozen traditional Western novels, with Poacher’s Moon offers a contemporary novel of the West that is equal parts a literary effort, a study of one man’s struggle with his passions and a satisfying mystery. What sets this book apart from other contemporary novels staged in the West is the amount of time Nesbitt spends ushering his protagonist, Wilf Kasmire, through his moral quandary, all the while allowing the plot to unspool at a reader-pleasing pace. With less introspection and a slightly quicker pace this novel could easily be an estimable installment in a series of contemporary thrillers reminiscent of those from fellow Wyoming writer C.J. Box. But drawing that much of a connection between the two different authors might be doing a disservice to Nesbitt’s slow-boil story. The language is tight, honed and solid, and at the same time there is a lyrical quality to Nesbitt’s writing that is offered sparingly but at just the right dose. Kasmire tries his hand full-time at guiding sports on deer and elk hunts. But what he slowly comes to realize, through the fluid — but gravitas-laden — arc of the story is that more often than not it is a mistake to make one’s passion an occupation. While there are murders and a variety of lesser crimes skillfully woven throughout the course of the novel, unlike a straightforward mystery, in Poacher’s Moon they feel incidental to the protagonist’s pursuit of meaning in his inner life and his interaction with the larger world. In this case, the journey is all. Poacher’s Moon is a novel meant to be chewed and savored, like an elk steak cooked to perfection. 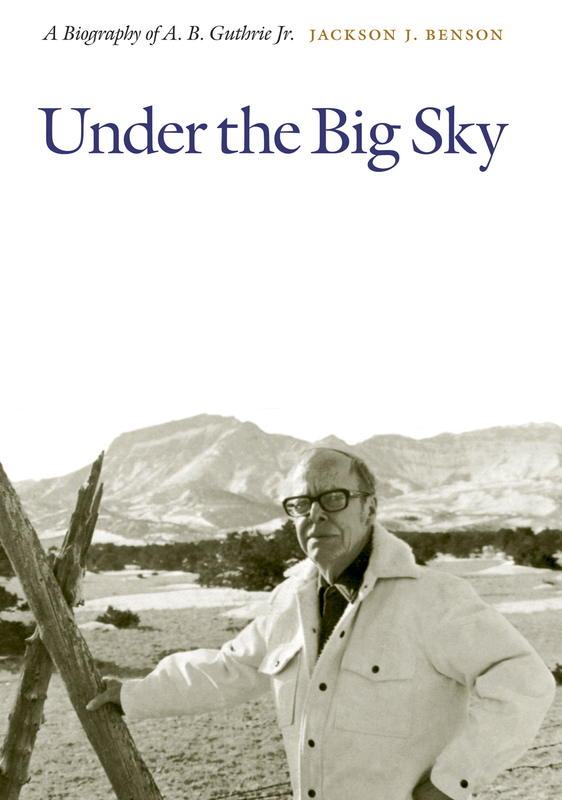 As biographies go, Under the Big Sky (University of Nebraska Press, $29.95) by Jackson J. Benson offers no earth-shaking revelations and doesn’t brim with superlative storytelling or dazzling prose and construction — but it doesn’t need to. It is a solid and well-written book that tells the reader all about Montana writer A.B. “Bud” Guthrie, Jr., about his life, his loves, his passions, his failings, and above all else, his work. With this straight-on biography, the portrait is rendered well enough that the reader ends up feeling he’s been given a privileged, intimate peek into the life of the subject. As expected, we find out that it was largely Montana that made Guthrie tick and sustained him on his lifelong journey of discovery as he rolled forward, exploring, poking, prodding and overturning rocks in an effort to get to the heart of his work. Before Guthrie appeared on, and later, to a large extent, defined, the Western literature scene, beginning with his epic novel of the era of the mountain men in The Big Sky, realism in Western literature largely was held at a distance, turned this way and that, and admired for its depictions of hardy pioneer stock and the insurmountable odds they somehow managed to surmount. Rare was the mention of gritty daily hardship and savage grinding endurance faced by those who were from and of the West and those who sought to be so. The Big Sky was the first of several masterworks to expose, warts and all, the beauty of the people and the place he’d grown up in and grown to love. Guthrie would go on to write a series of mysteries, also set in the West, as well as short stories, essays, children’s books, plays, poetry, a writing manual (recommended) and survived a stint in Hollywood — he wrote the screenplay for Shane — though it is for his literary Western novels depicting expansion and settlement that he is best known. Biographies of A.B. Guthrie, Jr. have been written before, and one of them, The Blue Hen’s Chick, was written by Guthrie himself. But in that fine read we are given little in the way of source material from other people. In Benson’s book we are treated to first-hand insights and reminiscences from the folks who knew Guthrie best — his family and friends. We are also given privileged access to private correspondence. And with such ingredients we are offered as complete a portrait of the man who gave us such masterworks as The Big Sky and The Way West as we are likely to get. How do we define the difference between wants and needs? 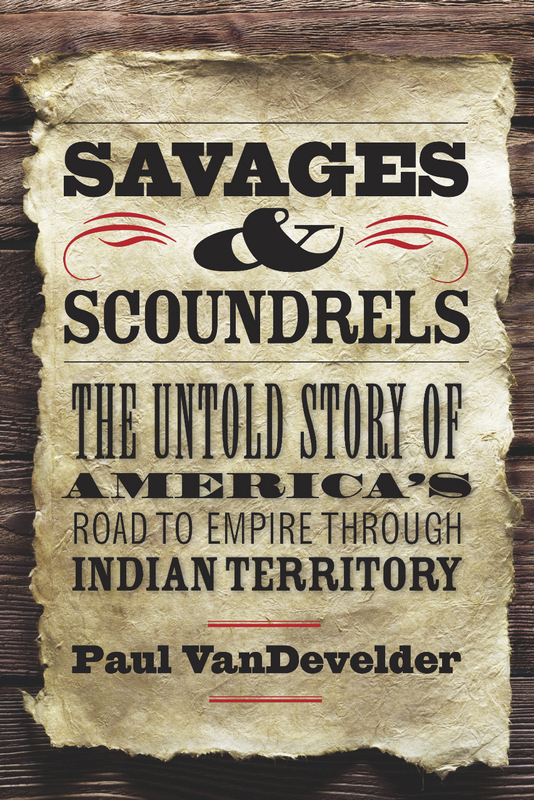 Paul VanDevelder’s new book Savages & Scoundrels: The Untold Story of America’s Road to Empire Through Indian Territory (Yale University Press, $26), illustrates just how this question has been ignored for hundreds of years by newcomers to this continent. Supported by a government that sanctioned their inexorable march from East to West, these white settlers of European descent laid claim to everything they saw, touched and tasted — natives be damned. That the native peoples of this region had been living in harmony with the land, and for the most part with each other, for thousands of years did little to blunt the rapacious appetites of the intruders. The vastness was looked upon as a one-time opportunity and governments and individuals alike meant to have at it. And in the subsequent centuries, they did have at it, in one form or another, until today the native people and their beloved homelands are shadows of their former selves. VanDevelder’s book chronicles the 371 formal treaties signed and broken throughout the 18th and 19th centuries — but focuses on the grand-scale 1851 Treaty of Fort Laramie, also known as Horse Creek. In an effort to appease both white settlers and Native Americans, and to eliminate mounting tensions, the federal government of the United States “formally recognized perpetual ownership by a dozen Native American tribes of 1.1 million square miles of the American West.” And then broke the treaty, as it had others … when settlers whimpered, when gold was discovered on Indian land, when new and different overland routes were deemed necessary … Often when a new excuse for a broken treaty was implemented as law, the government shrunk holdings or altogether displaced the Native Americans from their rapidly dwindling lands to smaller and far less worthy tracts unsuitable for habitation. As late as 1948, nearly a century after the failed Horse Creek Treaty, a “takings act” was signed into law that allowed Congress to “condemn” 156,000 acres of ancestral tribal homelands on the Upper Missouri River to make way for the building of Garrison Dam, once again displacing entire families and relocating them to poor farmland elsewhere. The book reminds us that no one escapes the unblinking eye of history. VanDevelder makes a strong argument that the fruit-heavy lives we lead now are affected in myriad ways by the residual effects of long and rough treatment received by Indians at the hands of the government. Much more than merely running the native people off their lands, throughout the past few centuries genocide seemed to be the standing order of the day, an order issued and sanctioned by the U.S. government. To be fair, Indians often doled out campaigns of brutality against the whites, though in retaliation for injustices they were beginning to realize would never shrink in scope. Paul VanDevelder’s book is rescued from the realm of dry, albeit important, subject matter by his solid ability to relate the seemingly endless series of complex and astounding situations in a cohesive, compelling and well-written package. It is that rare instance of a scholarly work written for the everyday person. And if ever there was a subject long-buried that should be resurrected, held up for scrutiny and learned from — surely the most useful and noble by-product of history — the litany of shame chronicled in Savages & Scoundrels: The Untold Story of America’s Road to Empire Through Indian Territory is it. What more can be said about America’s favorite gonzo journalist that hasn’t already been plastered across the Western skies, dribbled across magazine headlines and spewed all over the big, little and medium-size screens for all the world to see? As it turns out, plenty. 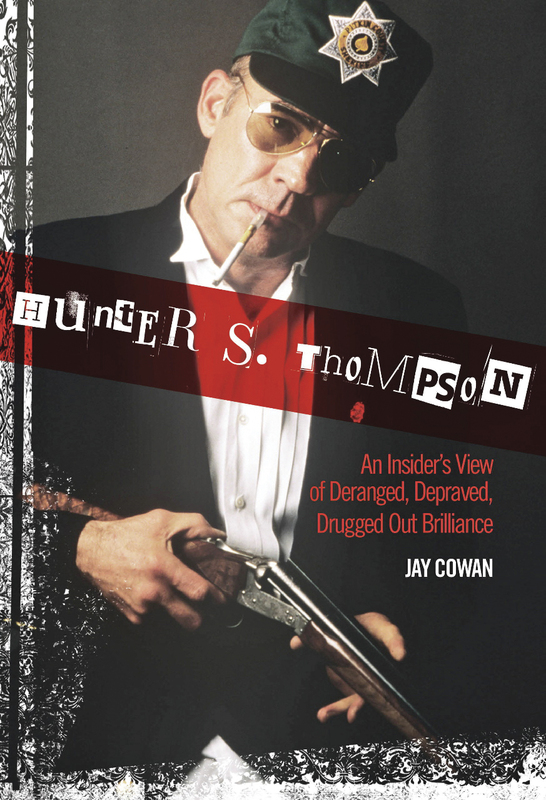 Jay Cowan, author of Hunter S. Thompson: An Insider’s View of Deranged, Depraved, Drugged Out Brilliance (Lyons Press, $24.95), was a close, personal friend of the late writer. No, really. And he has the scars to prove it. The book opens with a quote from Voltaire: “One owes respect to the living: To the Dead one owes only the truth.” And Cowan’s account is at times too bizarre to be anything but the truth. His unique perspective as Thompson’s one-time neighbor and longtime friend is refreshing in its candor as he found himself occasionally drawn in and occasionally distancing himself from the swirling center of the storm that was Thompson. We see Thompson as a writer, as an angry, drunken madman, as a man who lived up to his convictions (mostly), and who was, despite his best efforts to prove otherwise, just a man. Cowan reveals the good, the bad and the ugly of a lifelong friendship with a complex public figure, and the aftermath of such a relationship. What to do with all those stored memories? Those letters? Those 2 a.m. drunken phone calls? In Cowan’s hands, Thompson comes across as the type of friend many of us simultaneously cherish and try to avoid. The book’s greatest gift is not that it contains so much more unknown information about a figure sacred to so many (though there is plenty of that here, too), but its ability to let us know, in a clean, conversational read, that despite all of its ups and downs, true friendship abides, and that Thompson, for all of his foibles and follies, had a powerful and lasting effect on so many. And that he is missed.